Black Panther has been breaking records since before it hit theaters — and for good reason. It’s one of Marvel’s best movies to date, if not its best. It’s also an important moment for black fans everywhere who are finally able to see themselves represented as superheroes on screen. It’s hard for a super anticipated movie to live up to the hype, but Black Panther has shot past everyone’s expectations. Of course, in such a massive movie, there are also a lot of behind the scenes secrets just waiting for fans to dig up. 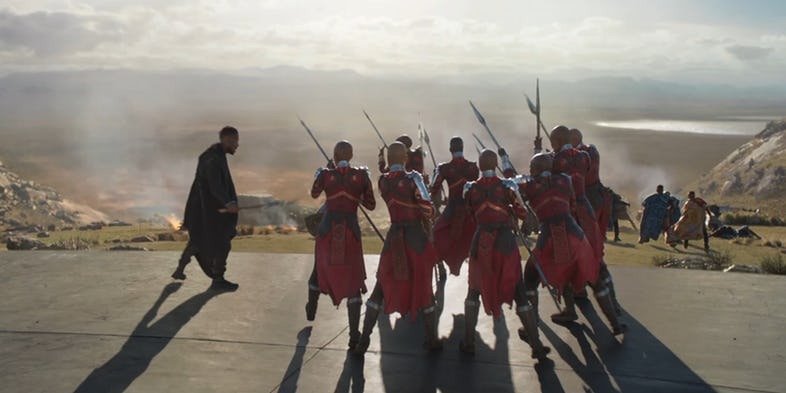 From the script to the makeup, countless hours of work went into making Wakanda a world that we’d want to live in. Now that everyone has (hopefully) seen the movie, we can talk about how the world of the Black Panther came to life. If you’ve ever been curious about deleted scenes, the writing process, or what celebrities gave input on the script, this is the list for you. T’Challa, Okoye, and Nakia vs. Klaue and his henchmen. Even on paper it sounds like a great fight, and it was even better on screen. The initial confrontation in the South Korean casino is exciting and beautifully shot. If you weren’t completely captivated by the action (or if you went to go see the movie multiple times), you might have noticed that a lot of the action in the casino is in a few longer than average shots. Originally, the fight sequence surrounding Okoye was supposed to be one continuous shot. Because there were so many characters, though, that proved to be impossible. Instead, they went with the long takes we see in the final edit. The scene was still incredible, so no real loss there. Donald Glover has been busy lately. Not only has he been racking up the awards for his show, Atlanta, and his album, Awaken, My Love!, but he’s also set to star in some major movies coming up. He’ll be Lando in Solo and Simba in the remake of The Lion King. You know, no big deal. He did make time to work on Black Panther, somehow. 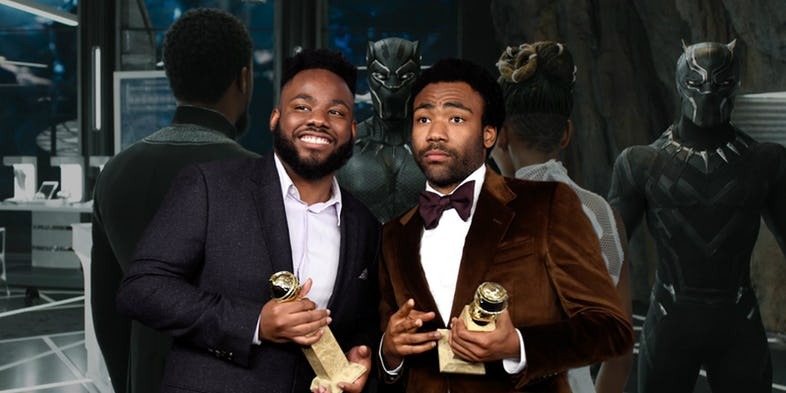 Coogler revealed that Donald and Stephen Glover both gave notes on a draft of a script. They apparently didn’t change anything significant — just pointed out places where characterization could be better, or where there was a chance for humor. They just might be the reason for the “What are those? !” joke. This might seem like just another nickname for a rare white dude in Wakanda, but the writers have actually taken it from a different Marvel character. In the comics, the White Wolf is a man named Hunter who crash landed in Wakanda as a child. His parents died in the crash, and Hunter grew up to take over the Wakandan secret police. 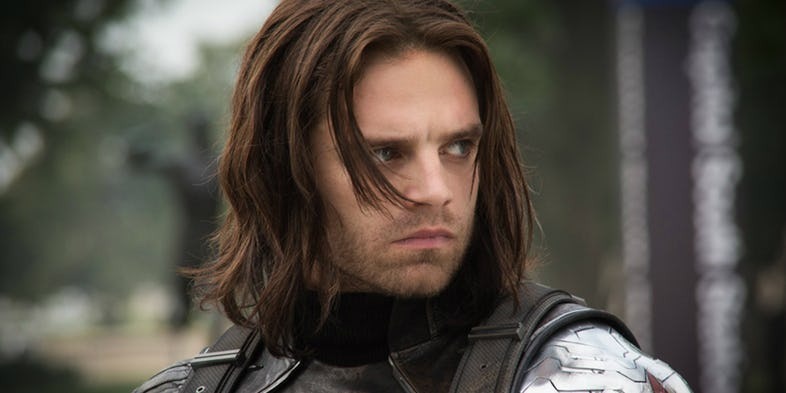 It’s possible that they’re planning for Bucky to take over the role that that comic character played, or maybe they just saw an opportunity for a good name. We can all agree that Shuri is easily the best character in Black Panther, right? Everyone is great, but she just steals the show. Not only is she brilliant and funny, but she knows how to fight when the situation calls for it. She manages to both fight and give Agent Ross directions at the same time. Apparently, her fight scenes could have been even more incredible. 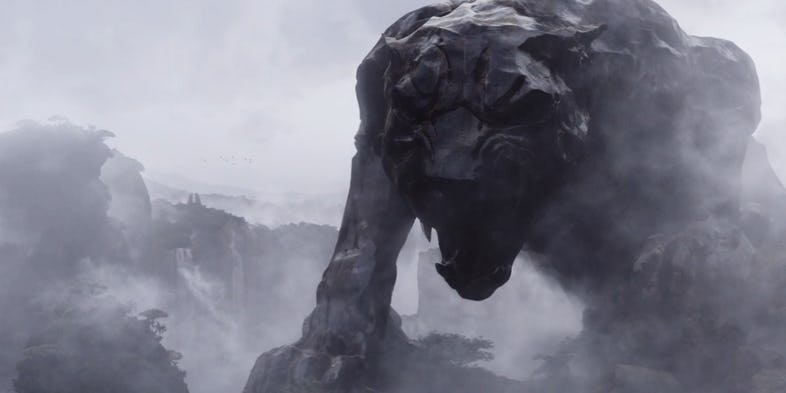 Early Panther concept art shows Shuri in her very own vibranium suit. Since she’s the one responsible for creating all of them, it makes sense that she would have made one for herself as well. We’re not quite sure why they decided to cut Shuri’s suit from the final production, but it might have been to keep the focus on Killmonger and T’Challa. In Roxane Gay’s World of Wakanda run, two members of the Dora Milaje (Ayo and Aneka) are in a relationship. 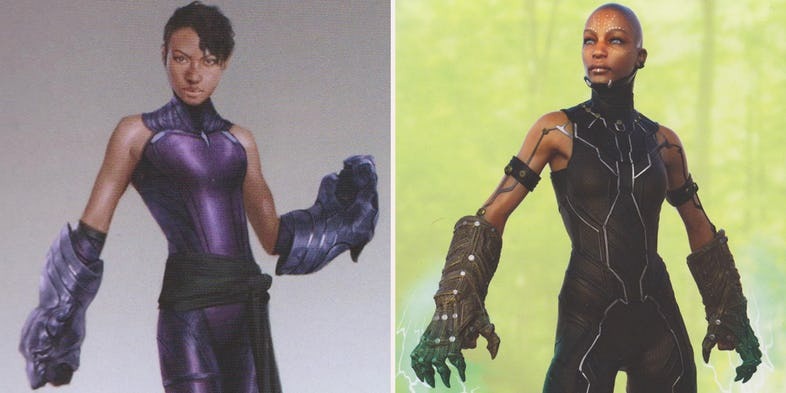 Of the two, Aneka doesn’t appear in the movie, but it seems like Okoye was meant to be a stand in for her. However, in the movie, Okoye is established as in a relationship with W’Kabi. This left fans wondering if the movies would ever touch on LGTBQ representation, especially since it was originally present in a run of the comics. 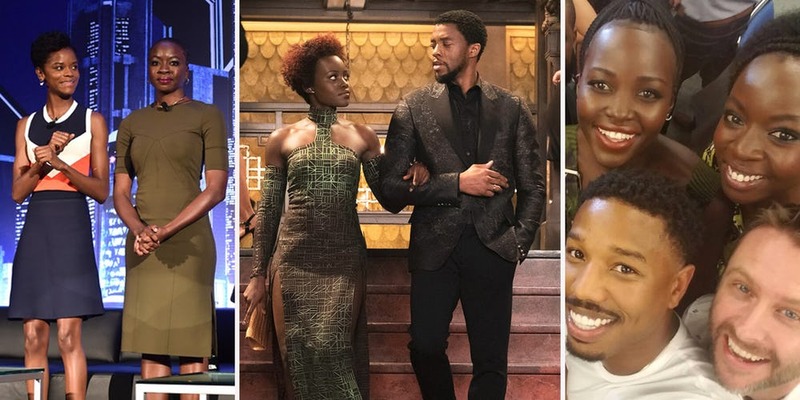 According to a few reports, there was originally a scene where Okoye and Ayo share a flirtatious moment on the way to T’Challa’s ceremony. It didn’t make it into the final cut, but it’s worth wondering if W’Kabi’s support of Killmonger will be enough to send Okoye into someone else’s arms. 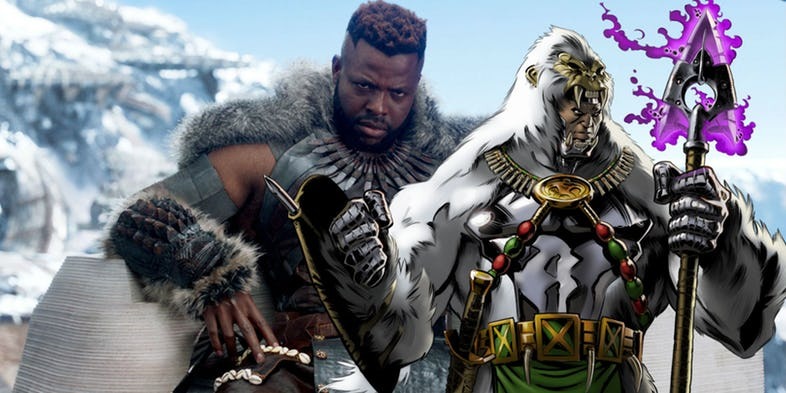 M’Baku has quickly become a fan-favorite, mostly because of actor Winston Duke’s perfect comedic timing. (The collective thirst of the Internet might have played a part, too.) It probably would have been harder for people to get on board if the studio had kept the character’s original name from the comics — Man-Ape. That name is more than a little cringe-worthy, and the way that the character was drawn doesn’t exactly help with damage control. The writers had to figure out a good way to include him in the movie. Even though you’ll never hear someone say “Man-Ape” on screen, M’Baku does show up in a mask when we first see him on screen. When Nakia addresses him in a later scene, she calls him the “great gorilla,” but we can tell that it’s respectful in Jabari culture — not demeaning. 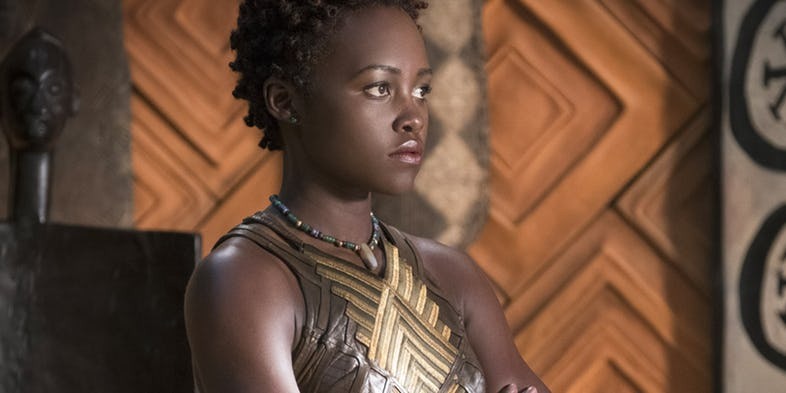 In the movie, Nakia is T’Challa’s ex-girlfriend who left Wakanda to try to make a difference. Even though she ended her romantic relationship with T’Challa, she’s clearly still loyal. Nakia is the one who saves the Queen Mother and Shuri, and she doesn’t hesitate to fight against Killmonger. It even looks like she and T’Challa are back together by the end. In the comics, though, their relationship is completely different. The Nakia in the comics wouldn’t dream of turning down an engagement with T’Challa — she’s obsessed with him to the point of trying to kill a girl she sees as a threat. She’s then exiled in disgrace… only to join Killmonger. We’d say that the writers made the right choice by changing her story for the big screen. If you’re one of the few people who actually read the credits while waiting for that Marvel mid-credits scene, you will have seen Hannah Beachler credited as Black Panther’s production designer. Ryan Coogler superfans probably already know who she is since she also worked on both Fruitvale Station and Creed. Also, if you love all things Academy Awards, you might know her name from her work on Moonlight. However, there’s another fandom who should know Beachler’s name– the Beyhive. 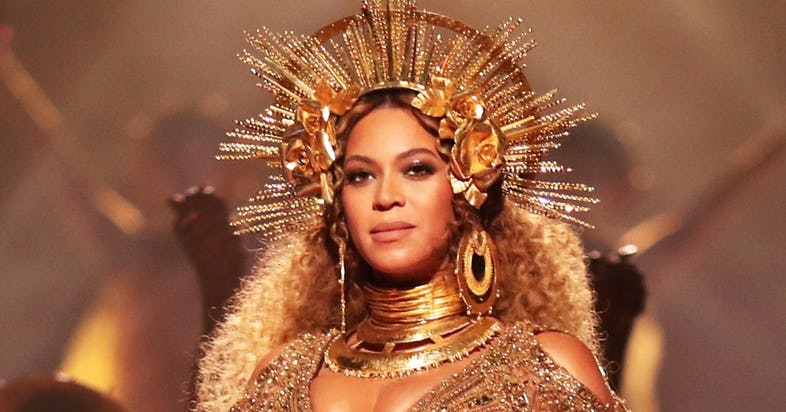 Hannah Beachler isn’t just responsible for Black Panther’s amazing afrofuturist design, she’s also the woman behind Beyoncé’s Lemonade movie. A Beyoncé project and Marvel movie usually seem miles apart… until Black Panther, of course. It seems like Beachler can do amazing work on just about everything. The first credits scene (because you definitely knew that there were two, right?) 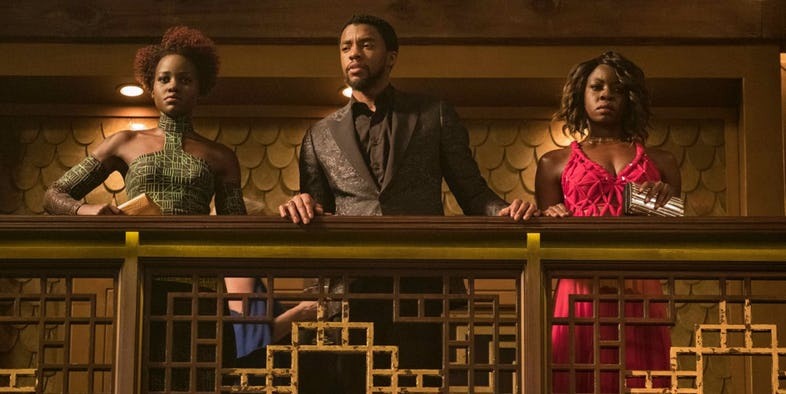 shows T’Challa, Nakia, and Okoye headed to the United Nations to finally reveal the truth about Wakanda. One random leader asks them what on earth a nation of farmers has to offer the rest of the world. 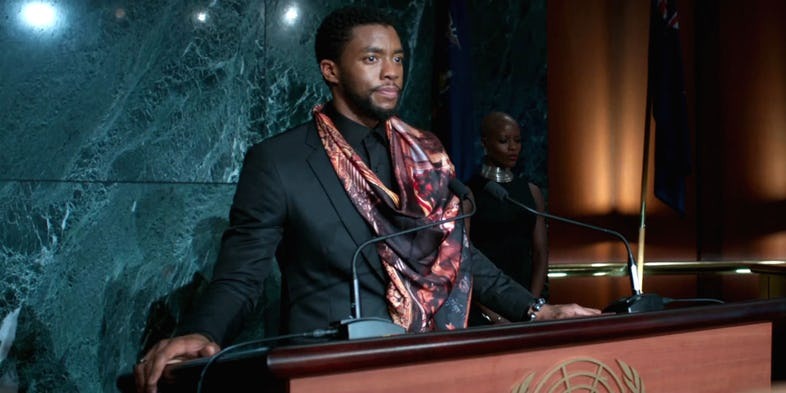 T’Challa smirks along with the viewers watching the movie… and the scene ends. That was originally supposed to be the actual ending of the movie, before any of the credits rolled at all. It packed a punch for a mid-credits scene, so it could have worked well. Ryan Coogler decided to go with a different emotion at the end, though, and help the movie come full circle. That’s why the movie ends with a kid discovering Wakanda, just like it began with another child asking about the country years before. The first people we see at the beginning of the movie are the “young” versions of N’Jobu (Killmonger’s dad), Zuri, and T’Chaka, T’Challa’s father. 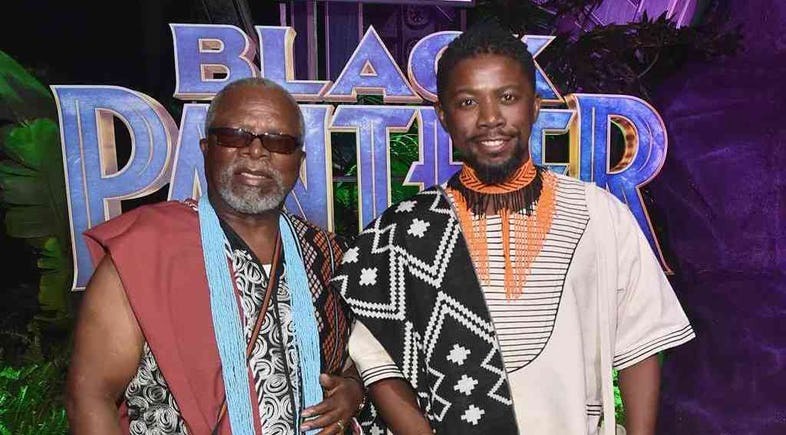 Marvel decided to avoid any potentially disastrous CGI to de-age John Kani and Forest Whitaker and just cast younger actors instead. You know, old school. Why spend buckets of money on de-aging an actor when you can get the real-life younger version in front of the camera, right? Most people guessed that Killmonger’s birthplace changed because director Ryan Coogler is originally from Oakland. He has strong ties to his hometown, but that’s not the only reason why Killmonger switched coasts. Oakland is also where the real life Black Panthers were initially founded. You can see little references to that in N’Jobu’s apartment, like the Public Enemy poster that hangs near a tapestry. The connection to the real Black Panthers was definitely too good to pass up, and thus moving Erik Killmonger out of New York City was a no brainer. 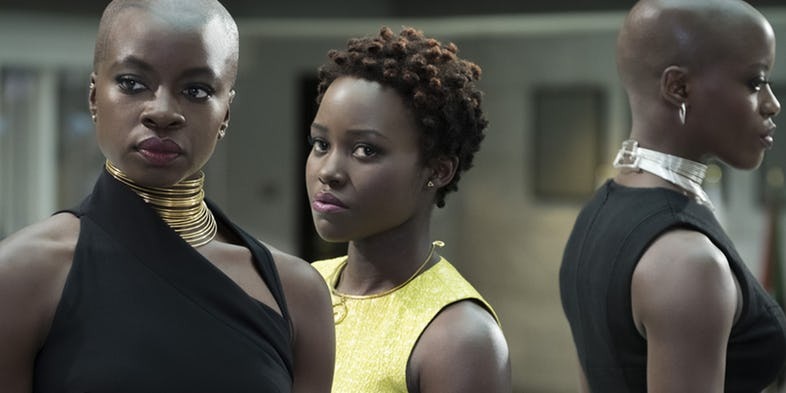 The women of Wakanda’s top security force instantly became iconic. Strong women with shaved heads who are incredible fighters? We stan. The women who played the Dora Milaje really did have to shave their heads in real life — no bald caps here. Also, in case you were wondering how so many actors were also fierce and formidable fighters, there’s an easy answer for that. The casting team chose a mix of actors, dancers, and stuntwomen to fill out the ranks of the Dora Milaje. That way, each one of them could show off a variety of skills. Need someone to do a flip? Got it. Need someone whose fighting looks natural and not choreographed? Check. The group became close offset as well, which can only be expected when you spend so much time together and shave your heads. The scarification covering Killmonger’s body was the character’s most significant physical trait. As he explains, he did each one himself after he took a life. He was keeping track of how many people he killed before eventually reaching T’Challa. The production team was just as methodical. 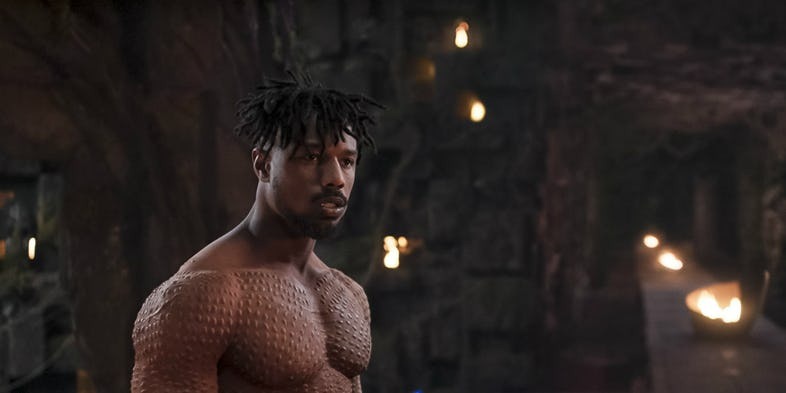 They tested what areas of his body Killmonger would have realistically been able to reach, to make sure that the scars made sense. 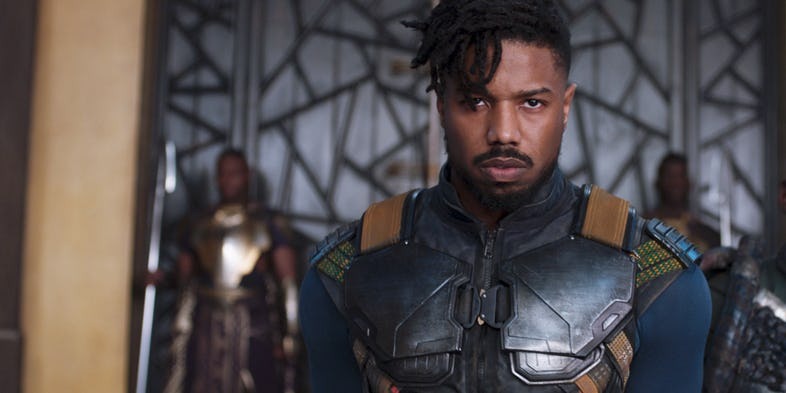 Then, to create the look, Michael B. Jordan had to come in to set hours earlier than the other actors to have each “scar” individually placed on his body, depending on what skin was going to be visible that day. The scars had to be touched up as the day continued since clothing would rub against the makeup and mess it up. At the end of each day, they also took hours to take off. Remember when there were rumors floating around that Black Panther was going to be four hours long? The rumor came from an early rough cut of the movie, which actually might have been that long. Coogler and his team ended up trimming some of the scripts to keep the narrative focused. There was a lot more world-building happening so that people would understand that Wakanda is a country and not just a city. In an early draft, we visited a few more Wakandan cities and were introduced to more characters. Nakia’s backstory was explained a bit more, and we even met her parents. The audience still got a good sense of her character in the final cut, so that ended up being a good choice. We’re not sure anyone would say no to more Wakanda, though. Panther, Black Panther. If you noticed some similarities between the James Bond movies and Black Panther (minus the womanizing), it wasn’t an accident. Ryan Coogler pulled from a lot of sources of inspiration to make this movie, but Marvel also has its own muses. 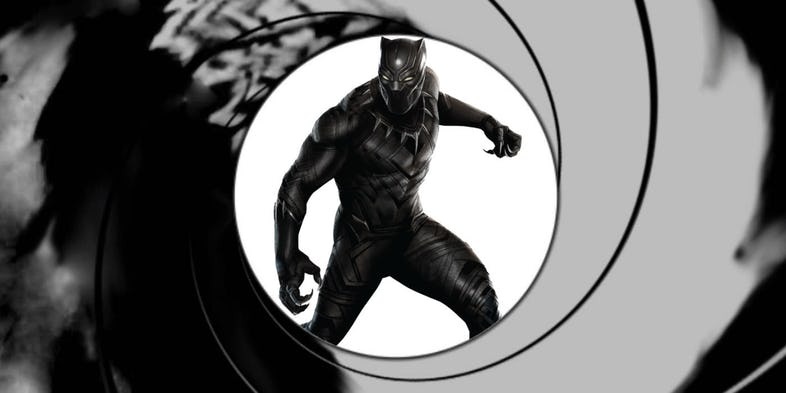 It was Kevin Feige, in fact, who suggested that the Black Panther essentially be Marvel’s Bond. They didn’t have to change much around to pay tribute to 007. For example, Shuri is the Q of Wakanda, the brains behind T’Challa’s tech and the person remotely controlling everything from an office, while CIA Agent Felix Leiter becomes CIA Agent Everett Ross. Also, of course, we can’t forget the Black Panther himself. There’s even a scene in a casino… hello, Skyfall. What other behind the scenes secrets about Black Panther do you know? Are there any that we missed? Let us know in the comments!